I have a new interest in hifi and it is in active speakers. It all started with the Hypex AS2.100 modules. These weren't perfect, but still impressed me with their tight, dynamic and clear sound. Sadly, they had a few flaws that spoiled their performance a bit, for me, but I was still convinced that active speakers were a superior solution. I had always known this, to be honest, but never really experienced it. The difference is actually quite clear and very significant, as far as I'm concerned. Most passive speakers now sound a bit muffled and soft to me, with quite clear problems in the crossover region. So, I started searching for other active speakers. To my surprise there's a whole world out there, called 'pro audio', with loads of active speakers. After some research I decided to try the sE Munro Egg 150 speakers, mostly based on reviews in pro audio magazines, but also on the fact that they're a bit different. Luckily sE are very helpful and forthcoming, and I had the speakers at home in no time at all. They even do a 'try at home' deal, where you can try the Eggs for a few weeks free of charge. The somewhat strangely named sE Electronics is a UK based company, founded in 2001. They are famous for their high quality, high value microphones and have the ambition to be "the next Neumann". Ambitious indeed! Still, sE claim to be the biggest microphone brand in the UK already, and the fastest growing in Europe and the USA, so they must be doing something right. They have only recently decided to also start making monitors, and the Egg 150 is their first, and still only, loudspeaker. The Munro Egg 150 is a two way system with a 6 inch woofer and a 1 inch soft dome tweeter in a front ported, egg shaped enclosure. They are active, as you must have realised by now, but they are a bit different from the standard active studio monitor. Most have the amplification and active crossover built into the speakers, but the Eggs have a separate box for all electronics, and the speakers themselves actually only contain the drivers. 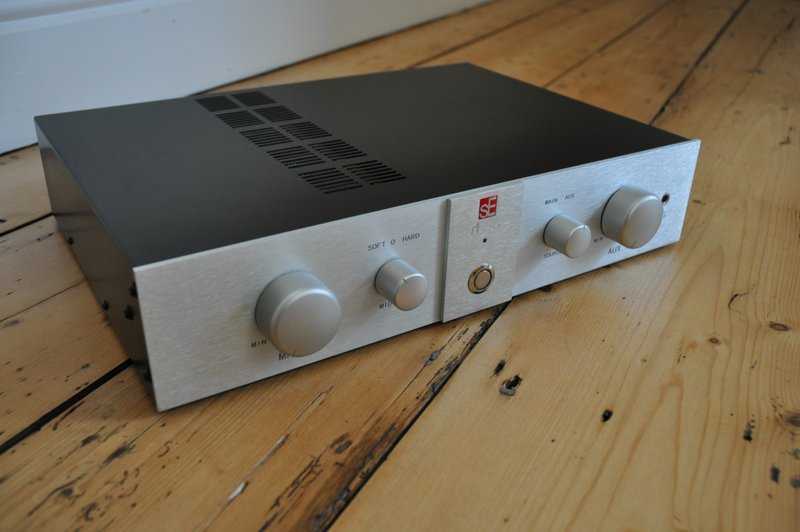 The box looks like an ordinary integrated amp, and that is indeed what it is, but not as we know it: it only has two inputs, one balanced and one single ended, and each of these inputs has its own volume control! Slightly unexpected, but simple to explain: in a studio environment you'll want to compare the output of a mixing desk to the output from an end-user device, like a CD player. Studio equipment uses balanced connections and consumer audio uses single ended ones. To do a proper comparison the volume has to be matched too, which explains the double volume controls. All very sensible, but possibly a bit of a pain at home. Most people will want to connect more than one single ended source and will be forced to add a switchbox to be able to do so. An additional annoyance is the lack of remote control, although I personally don't care too much about that. 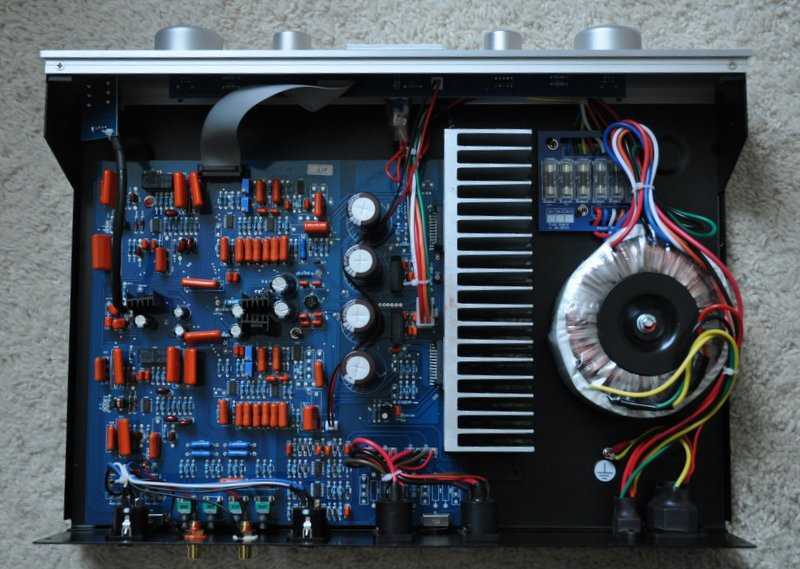 On the other hand, the electronics box has a few features that we never see on a normal amp. The bass and treble can be adjusted at the back to match your room. Bass cannot be turned up, only down, but the maximum setting for the treble is +1dB. You need a screw driver to make the adjustments, so this is not something that can be changed on a regular basis or used as tone control, but it's very useful anyway. Then there's also an unexpected "mid eq" button on the front with 3 settings: 'soft', '0' and 'hard'. This adjusts the midrange, with 'soft' having the midrange slightly reduced, '0' being basically flat and 'hard' having the mids slightly accentuated. In reality the effect is rather subtle and even the difference between 'soft' and 'hard' isn't all that easy to hear. Again, this is a feature that could be of use in a studio environment to bring out the vocals, but is not of much use at home. I generally used the flat setting. There's also a built in headphones amp, which is nice. Most active monitors have a high-pass filter that cuts out the deepest bass for use with a subwoofer. The Eggs lack this and do not even provide a subwoofer output. This makes it very difficult to use them with a sub, limiting their use in the home environment even further. The bass control at the back is not usable for this and the eggs don't even come with a set of bungs to put in the bass ports. Luckily, they did work quite well in my room, but if they don't then you're basically stuffed. Then there's the looks. I kind of like the way they look, but most people will find them a challenging addition to their living room. They can look a bit odd, certainly on stands. That strange shape has been used for a reason, obviously - pro audio users aren't normally into interior design, at least not at work. The egg shape serves two purposes: first to help the speaker to radiate sound nice and evenly in all directions, without coloration or reflections from sharp edges. And secondly, it will prevent internal and cabinet resonance. Without any flat, parallel surfaces inside the cabinet, internal reflections are less harmful and the speaker should sound less 'boxy'. In addition, the material that is used to make the cabinets is relatively light. This is possible because of the added strength of the shape and the lack of resonance, and prevents energy storage (the panels still resonating while the sound is already gone). In theory all this should result in a better sound, with less coloration and more spatial information. The Eggs have two LEDs above the tweeter. These allow you to align the speakers for optimal performance. When you can see both lights clearly, you're in the hotspot. Again, these might be useful in a studio, but I was very happy that they could be switched off. One final point is that the speaker cables used by the Eggs are not any standard type, but specials ones that contain all wiring for the two speakers, and for the LED lights. They come with Speakon connectors on both sides, which makes connecting them very easy. The provided cables are 3 meters long, and if you need more you'll have to try to order longer ones from sE or make a new set yourself. They are also very thick and stiff. The built quality of the electronics box could be a bit disappointing to audiophile sensitivities. It isn't the usual OTT (that's Over The Top for the older generation), but merely adequate (that "good enough’ for the younger readers) and to me this only shows how ridiculous even budget hifi has become, with centimetre thick fronts and silly feet. The sE box is perfectly fine and, more importantly, the build quality and component choice on the inside is excellent. 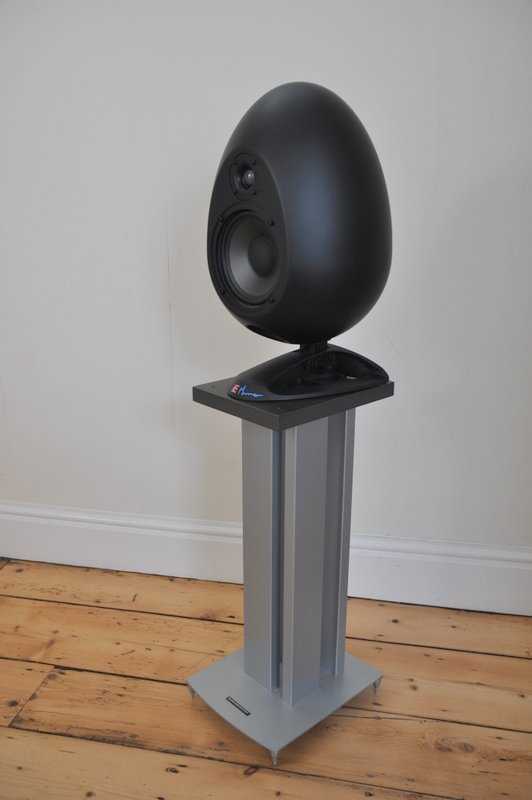 Finally, these speakers need to be used on stands, but you have to make sure you have stands with a relatively large upper surface, as the base of the Eggs is rather large and needs to be supported at the edges. I needed to add a bit of MDF to my stands to accommodate them. I would also recommend good quality stands, with good damping, as the quiet refinement of the Eggs will allow you to hear any contribution the stands will make to the sound. I initially used sand-filled stands, borrowed from a friend, which worked quite well. Later, I replaced these with Partington Super Dreadnought stands and these sounded horrible until I completely filled them with sand. This is the big issue. As you must have gathered by now, these are not the most practical speakers to live with and their looks are an acquired taste, but I would be more than willing to put up with all that if the sound is right. The short story is simple enough: it is. As soon as I started listening to them it all didn't matter anymore, and I was completely convinced by the whole concept. Initially they were a little bit on the bright side, but they come with the treble adjustment set at the maximum +1dB, so this didn't come as a surprise. Out came the screwdrivers and the treble was reduced by a quarter turn, which should be about 1-1.5dB softer. This sounded fine to me and I didn't feel any need for further changes during the rest of the review period. Set like this, the Eggs produced a basically neutral sound, perhaps even slightly on the warm side. There are a few things that immediately come to your attention when you start listening to these Eggs. The sound is extremely clean and has tremendous clarity, the soundstage is as good as I've ever heard and bass is strong and quite impressive for a speaker this size. They also clearly show the classic active advantages of tightness, extension, excellent dynamic expression and the ability to play loud without problems. They always sound composed, and never aggressive or compressed unless you play them very loud. I have to add that I used them in a room of approximately 5 by 5 meter, and they coped fine with that. It's not only dynamics in the sense of being able to play loud, by the way, but also the ability to make things come alive and to resolve micro dynamics. Listen a bit longer and you'll find some less expected traits. Being clean, clear and tight often makes a speaker analytic and overly sensitive to recording quality, but the Eggs are actually quite musical, easy to listen to and even play lesser recordings without pain. The next surprise is how flexible they are: they play rock, jazz, pop, classical and all other sorts of music I have in my collection, all equally enjoyable. This is all the more impressive because they have excellent resolution and good bandwidth, so it is certainly not the case that they leave things out or cover anything up. To the contrary: they expose as much as any other speaker I've had at home, and this includes my SEAS Exotic full range speakers driven by my Icon Audio valve amp, a pretty revealing system I would think. The more I listened, the more I was amazed at the clarity with which this system presents things. I think this has mainly to do with the crossover region, which is virtually completely free of any artefacts, at least as far as I can hear. This works magic on voices: the combination of brilliant detail reproduction and freedom from distortion produced a transparency that I had not experienced before and which gives voices a level of realism that can be uncanny at times. The fantastic soundstage also helps by giving the voice, the person actually, a rock steady location in a fully 3D acoustic space. When I reviewed the Elipson Planet L speakers I noticed that they were very, very good at precisely the same thing, but there's no denying that the Eggs are even better at this. What is also remarkable is their ability to let each recording sound like itself, instead of like your system. Of course they have a character, and that does have an effect on the reproduction, but it is sufficiently subtle to not interfere with the specific atmosphere of a recording. Small sounds small, big sounds big, intimate sounds intimate and aggressive sounds aggressive. Not many systems at this price can do that. 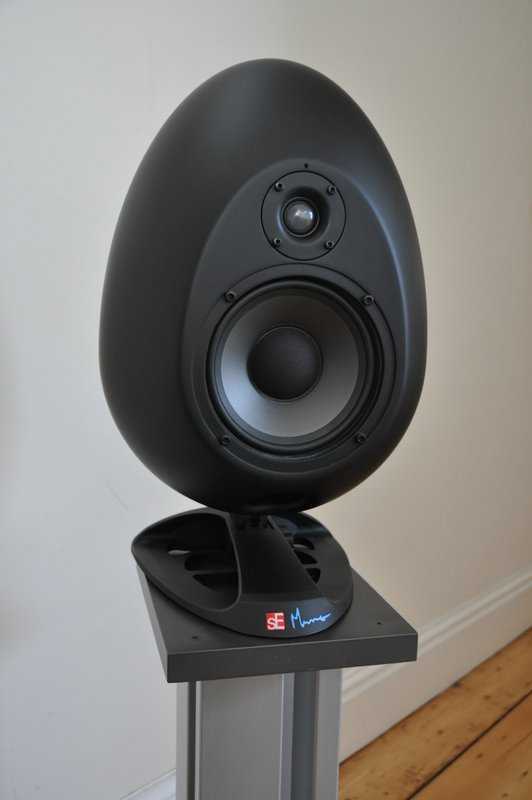 Compared to other speakers, even active ones, the Eggs also show incredible refinement. They make most other speakers in this class sound slightly harsh and edgy in comparison. This can even give the impression that the Eggs sound somewhat tame and lack a bit of presence, but once you are used to it you realise that it’s most other speakers adding something, not the Eggs leaving anything out. When required, these speakers can sound as crisp and bright as the recording dictates. Granted, they don't have the phenomenal extension and pure silky refinement of a pair of Revelator tweeters, nor the detail and speed of the SEAS Millennium, but they are not very far off. The only area that is slightly less satisfying, compared to the rest of the spectrum, is the bass. It is sufficiently extended en deep enough, but somewhat softer that de mids and highs. It could do with a bit more texture and impact, but I do realise that this is asking a lot from a woofer this size. Of course, this is also partly what makes them so comfortable to listen to, so it will always be a trade-off. It does, however, affect the way these speakers deal with complex rhythms. They are OK rhythmically, but you could do better for this price if this is your first priority. What can also be annoying is the fact that the bass port can be heard from time to time. It only happens with certain recordings, and only when playing reasonable loud, but it certainly is a flaw. Again, a high pass filter, or even a pair of port bungs, could solve the problem, but are sadly not provided. Another minor point is that they need to be played at a certain volume to really come alive. On lower volumes they can sound a bit flat. I suspect that this is more a function of their realism than a proper flaw. Better systems are often more critical of correct volume and need to be played at levels that are approximately realistic. The Eggs do tempt you to play quite loud, though, and if this is not possible in your situation then these might not be the right speaker for you. In defence of the Eggs I do have to say that speakers like these can be their own biggest enemies, in a way, as the clean, pure and precise sound they can produce allows you not only to hear the music with great clarity, but also any shortcomings or additions by the speakers themselves. When taking everything into consideration, the fact remains that there is only very little to criticise and so much to enjoy. All in all, these active studio monitors are surprisingly lounge friendly, sound wise. My biggest complaints are the lack of a subwoofer output and accompanying high-pass filter, and the limited number of inputs. There’s also a bit of port noise, which can be annoying. But otherwise they are great. They have that rare combination of a sound that engages and keeps you listening, without ever becoming tiring. They produce a very composed, full bodied sound. These are also the clearest, best staging and most refined sounding speakers I’ve ever had in my system. They are musical, play all sorts of music, go more than loud enough and offer unprecedented insights in my music collection. The feature set might be a bit strange for the home situation, but for this sort of money the sound is truly superb. Actually, I couldn't resist buying the review samples: I cannot give a higher recommendation than that.